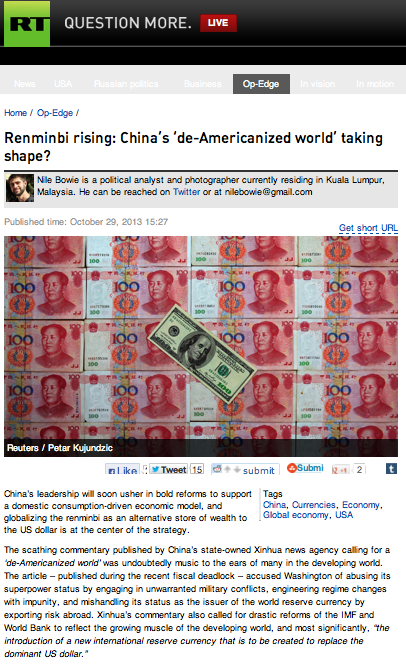 Renminbi rising: China’s ‘de-Americanized world’ taking shape? 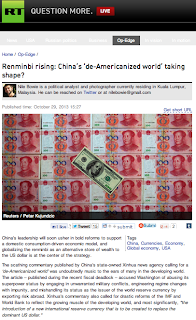 Home Editorials Renminbi rising: China’s ‘de-Americanized world’ taking shape? China’s leadership will soon usher in bold reforms to support a domestic consumption-driven economic model, and globalizing the renminbi as an alternative store of wealth to the US dollar is at the center of the strategy. The planned reforms led by the Xi Jinping administration in Beijing should be viewed through the lenses of the position taken by this article, with the end goal being the full convertibility and internationalization of the renminbi. Nile Bowie is a Malaysia-based political analyst and a columnist with Russia Today. He can be reached at nilebowie@gmail.com.